This blog is dedicated to both beginner and established music producers alike. There will be regular updates featuring industry level tips and tricks related to the art of modern music production as well as free giveaways and interviews with big name underground producers. If you are keen to learn the craft, or looking to contribute to helping someone else, then subscribe here and we can spread some knowledge and making the electronic music scene a bigger and better place! This is the study of how the human brain, receives, processes and interprets sounds. This is a hugely complex field, in which an entire PhD can be focused on, so needless to say in this short chapter we will barely scratch the surface of the subject. However there are some more accessible aspects to the science which will have a positive bearing on your production skills and mixes when considered and then studied further. Think of this article as the entrance to the rabbit hole! Firstly there are some software tools which will help you to further control and enhance your music’s psychoacoustic potential, by give accurate readings in terms of frequency content, stereo spread and phase correlation.... Let’s look further. Analysers are devices which provide visual readings for the frequency content of a piece of audio, in real-time, or otherwise. They operate on the same principle as an Equalizer in that the frequency reading increases from left to right (x axis). And the volume of each frequency is measured in decibels (y axis). So we can basically see what frequencies a certain sound / part is made up of by running it into a Spectrum (or Frequency) Analyzer. These are very useful in modern production, as this now allows us to really get inside the tune and have an accurate visual display of what certain effects or processes are doing to the sound when applied. A big part of getting a good mix is to make sure the tune sounds full but not crowded. Using a combination of analysers and equalisers, you can essentially sculpt every sound to fit into your track so that it has its own space in the mix, but also is not leaving any frequency holes in the overall mix which can give a cheap, almost lacking sound. Generally spectrum analysers can be found in plug-in format, and there are even several freeware versions available online. When using a sequencing program it’s advisable to place a real-time analyser on the main output of the mixer so that whenever a sound is played on its own, a spectral reading can be taken, and a more accurate understanding of the particular sound is gained. In reverse you can play all the sounds together as the finished track, and then see what the overall frequency response is for the tune, maybe making adjustments so that Fletcher Munson theory can be implemented for a more aurally pleasing result (see later section on F-M curves). Some Frequency analysers (like the Waves™ PAZ seen above) also have a stereo readout built in, which makes it possible to see how much stereo variance there is within a musical part or recording. I.e. how much the signal naturally fluctuates from left to right in volume. Once the stereo content of a signal has been analysed, it can be further shaped and controlled so as not to take up too much space in the mix of the finished track, this is done with imagers. There are many available in plug-in format, ranging from multiband imagers (which break the frequency of the signal down into several bands which can be independently adjusted in terms of their stereo content) to simplified imagers which can easily turn a stereo signal into a mono one for purposes of a fuller mix down. The opposite process is often applied if a sound is sounding too central and flat. To resolve this, the sound can be ‘imaged’ or spread further across the stereo field to give a more acoustically pleasing effect, by using more of the distance between the left and right speakers. Ideally you are looking for a mix of mono (central sounds) and imaged (wider sounds) within your mix. Items such as Kick drums, Bottoms of snares and bass-lines tend to work better when in Mono, as this means they can be pushed louder, to give a punchier sound which comes across better on nightclub systems. As you move further up the frequency spectrum within your song sounds can be allowed to be spread wider. Also various stereo effects, such as delay, can be applied to provide interest to the mix. As Humans we do not perceive all frequencies of sound at the same level. Our ears are more sensitive to some frequencies and less sensitive to others. In addition, this sensitivity changes with the sound pressure level (SPL)(Volume), too. From looking at the chart above you'll notice it is marked horizontally with a scale denoting the frequency of sound. Vertically it's marked in Volume (decibels). On the chart are a number of curved lines, each with a number (loudness level) marked. Let's begin by looking at the lowest solid line marked with a loudness level of 10 phons. (The loudness level in phons is a subjective sensation--this is the level we perceive the sound to be at.) From about 500Hz to roughly 1,500Hz the line is flat on the 10dB scale. This means that for us to perceive the sound being a loudness level (LL) of 10 phons, (the overall curved line), frequencies from 500Hz to 1,500 Hz must be 10dB. Make sense so far? OK, now look further into the higher frequencies, say 5,000Hz. Notice the line dips here--this says we perceive 5,000Hz to be 10 phons when the source is actually only 6dB. To perceive 10,000Hz at the same level (10 phons), it would need to be about 20dB. From this we can clearly see the ear is more sensitive in the 2,000Hz to 5,000Hz range, yet not nearly as sensitive in the 6,000Hz and up range. Let’s take a look down at the lower frequencies now, say 100Hz. For us to perceive 100Hz as loud as we do 1,000Hz (when the source is at 10dB), the 100Hz source must be at 30dB–that's 20dB higher than the 1,000Hz signal! Looking even farther down, a 20Hz signal must be nearly 75dB (65dB higher than the 1,000Hz signal)! We can clearly see our ears are not very sensitive to the lower frequencies, even more so at lower SPL levels. Notice how as the overall loudness level increases that the low frequency curved lines flatten out. This is because at higher SPL's we're more sensitive to those lower frequencies. Also notice that as the SPL increases we're less and less sensitive to the frequencies above 6,000Hz. This explains why soft music seems to sound less rich and full than louder music--the louder the music is, the more we perceive the lower frequencies, thus it sounds more full and rich. This is why many stereo systems have a loudness switch--when you're listening to the stereo at low volumes, you activate this switch which boosts the low and some of the high frequencies of the sound. Typically people become uncomfortable with levels above 100dB. You'll notice 100dB is needed to perceive a loudness level of 100 phons at 1,000Hz--only 90dB is required to give a perceived loudness level of 100 phons at 4,000Hz. Again, about 104dB is required to produce a perceived loudness level of 100 phons at 100Hz. Why is all of this so important? 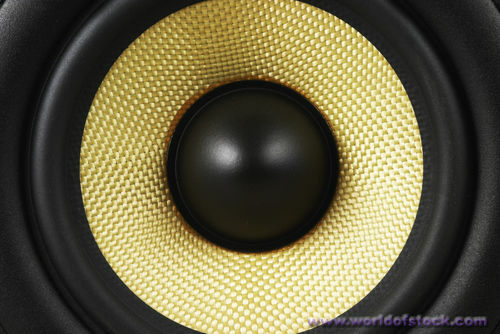 Simply put, it helps us understand why many subwoofers are required to produce a loudness level equal to those attained at higher frequencies. It shows us how much more sensitive our ears are to the higher frequencies which can become very piercing if too loud. Many times it helps to use an equalizer to cut some of the frequencies around 2,000Hz to 5,000Hz a little if music is being played loudly. This action keeps the sound crisp sounding, but not distorted and piercing at higher SPL (volume) levels. With careful use of analyser readings you are able to follow the General shape of a Fletcher Munson curve over the output of your main mix for improved Psychoacoustic effect. As this matches the natural response curve of your ear, the overall effect is a balanced sounding mixdown. Frequency masking is a Psychoacoustic effect when two or more sounds or instruments are competing for space within your mix when they occur at the same time. This is something that you will already be having problems with in your music, but are unaware of its nature. Listen to your mix in mono. This sums everything together and pressure tests the overall track, this is particularly if you are looking to play your music on a nightclub sound system as they often output stereo recordings in mono. Level all your tracks to unity 0 dB and then pan each track to the left speaker followed by the right. You're listening to see if each sound sweeps audibly from the left, through the centre, and off to the right - If you can hear it crossing over, then you're more than likely free of any heavy masking. Establish the most important sound. Make it the priority over the other accompanying parts - In other words: Filter the secondary sound with EQ where possible. Use the problematic part elsewhere in the song, when it is not clashing with others. Sometimes an entirely new sound (particularly when working with synthesisers) needs to be made / used as the current one is naturally sitting on the wrong note (too high or low) and masking other instruments. Temporal masking or "non-simultaneous masking"
This is when the signal and masker are not presented at the same time. This can be split into forward masking and backward masking. Forward masking is when the masker is presented first and the signal follows it. Masking that obscures a sound immediately preceding the masker is called backward masking or pre-masking and masking that obscures a sound immediately following the masker is called forward masking or post-masking. Temporal masking's effectiveness attenuates exponentially from the onset and offset of the masker, with the onset attenuation lasting approximately 20 ms and the offset attenuation lasting approximately 100 ms. Similar to simultaneous masking, temporal masking reveals the frequency analysis performed by the auditory system; forward masking thresholds for complex harmonic tones (e.g., a saw tooth wave with a fundamental frequency of 500 Hz) exhibit threshold peaks (i.e., high masking levels) for frequency bands centered on the first several harmonics. In fact, auditory bandwidths measured from forward masking thresholds are narrower and more accurate than those measured using simultaneous masking. Our auditory system has evolved to become remarkably effective at separating streams of sound from different sources, and in fact, it is difficult for us, and requires considerable conscious effort, to group even very similar ‘sound streams’ (in terms of pitch and timbre) into a single perceived stream. Our ears perceive melodies much easier if all the tones belong to the same audio stream – you don’t hear too many catchy riffs that are made up of several different instruments! This concept is a useful one to remember when you building a track – think of complex evolving pads and acid leads that ‘move’ gradually over time – these are often perceived as single streams, but the composite sounds change gradually, timbres shifting, ADSR settings adjusting, etc, and our minds are guided into analysing these as single streams, despite the fact that the start and end of a stream might be perceived as separate if heard together. Experimenting with this idea can give very interesting sonic perceptions. Try making sounds jump out suddenly from a stream by introducing a sudden distortion, or creating a riff from a series of sounds that are sonically similar, but not identical, to give a fast dynamic edge to a track– Noisia style Reese progressions, for example - or try modulating multiple parameters on a looped sample gradually to give an evolving deep atmosphere or psychedelic house lead. It’s easy to look at this as being a mysterious field that is massively complicated and hugely expensive. The fact is that isn’t true. The chances are you already have some of the basic kit necessary to be making music with and with a couple of additions to your set-up you will potentially have enough technology to write pretty much any style of music. The rest is down to you, putting in practice and research, attending talks and courses, as well as reading voraciously on the subject. Because of the rate computer technology is advancing it’s a really exciting time for you to be getting into this field. Also if you are worried about not currently having musical ability...it’s not a problem! You aren’t playing an instrument so there is no need to develop hand-eye coordination here. Learning a small amount of music theory, such as scales and harmonies goes a loooooong way in the computer realm, what’s great is that all this information is available free on the internet! So if you are committed, patient and enthusiastic towards music, there is absolutely nothing stopping you from learning how to make it yourself. I speak from experience because I started out in just this way, I had no real musical knowledge and was pretty bad with computers, but I’m now making music that is being played by DJ’s in clubs and on the radio and being sold online. Trust me it’s easily possible. If I can do it, you can too. Computer- To start with, your home PC is probably more than capable of running most software to an adequate level. Standard computers are running factory fitted dual core processors and often come with huge amounts of memory compared to the days when 512mb was all you got! So with a bit of tweaking your home laptop / desktop is your main centre for production. Software – There are loads of different types of software out there, but they essentially all do the same thing: Record, edit & sequence sound. So don’t get too caught up in this, your creativity is what’s important. However Reason 5 by Propellerheads is probably the best thing you can get if you’re learning. It’s easy to install and run, it doesn’t demand much of your computer, there is lots of support to learn it, but most importantly it’s really fun to use! Audio Interface/Soundcard- Initially you don’t need a specialist soundcard, the one that comes with your computer is good enough. Once you have got the basics of production down you may want to upgrade, for around £50 you can get to a better quality one with some more input/output options. Monitors/Speakers/headphones – Again you don’t need top end stuff to start with, your home hi-fi is usable as long as it has an aux in. However I would say investing a little bit on some headphones is a very good idea. For much less than speakers you can get a very accurate sound. Brands like AKG, Senheiser or Beyerdynamic are good places to start as they specialise in headphones. £100 will get you some awesome sounding headphones. Read lots of reviews and make an informed decision. Sample library – This is so much fun! I literally love collecting samples and sounds! I have a huge library now which I absolutely treasure. Ranging from specialist packs which I’ve brought, to sounds I recorded whilst travelling in the jungles of Borneo. There are a variety of samples I can draw on to make my music with. There are loads of packs available free online, so initially you won’t have to pay a penny. But if you speak to any artist their library is what makes them unique. So get collecting! Time- Ideally you want to invest as much time into this as you can as the equation below will demonstrate. 8 hours a week is good. But 15 hours is more like it. We are a music production school based in Bristol UK. We run top class music production courses and cutting edge seminars featuring underground musics biggest names.